The mixed doubles crew of Luke Nisbet and Jenna Ward stole the limelight at the HiQ Surfski Challenge on Friday night, as the penultimate leg of the popular FNB Surfski Series had to be modified to suit the heavy cyclone surf conditions in Durban Bay. Nisbet and Ward won their fourth race of the seven legs raced and in the process defended their series title and won the overall series doubles title as well. “It feels fantastic to retain our title and to win the doubles series overall,” said an elated Ward. “It is a wonderful way to start the year, racing on Friday evenings, and it has become an important part of my bigger training plan. “We get involved in such competitive races with the other guys in the doubles that I race harder than I would if I was in my single,” she explained. Ward said much credit was due to Nisbet for the manner in which the combination has clicked, and his intuitive ability in technical surf and swell conditions. “He is amazing! He gets us onto runs that other paddlers don’t even see,” said Ward. She added that series organiser had made a great call in restructuring the race. Series winner Matt Bouman won the key overall singles race, once again holding off the tenacious Wade Krieger for the top step of the podium, but they were thirty seconds off the fastest time of the evening posted by Nisbet and Ward in winning the double ski race. The women’s crown went to London Olympics bronze medallist Bridgitte Hartley, who raced solidly to finish eighth overall, with youngsters Amy Peckett and Cara Waud taking the spoils for the first womens’ double. Connor Botha was the quickest of the short course paddlers, sneaking across the line on the beach ahead of Dave Rees and Wise Mvubu. A swinging South Westerly front influenced by the Indian Ocean cyclone whipped up big surf in the southern corner of the Bay, forcing the event organisers to shift the start from Addington beach, where a heavy mid-break was crunching onto the sandbank, to below the Moyo pier. Once behind the backline, the racing proved to be as competitive as always, as the series that boasts some of the best of the world’s surfski paddlers, got under way. With the heavy surf breaking at The mound, a safety-first course saw the field race out to sea and then back inside The Mound to South Beach and back to the revised start venue at Vetch’s Reef. 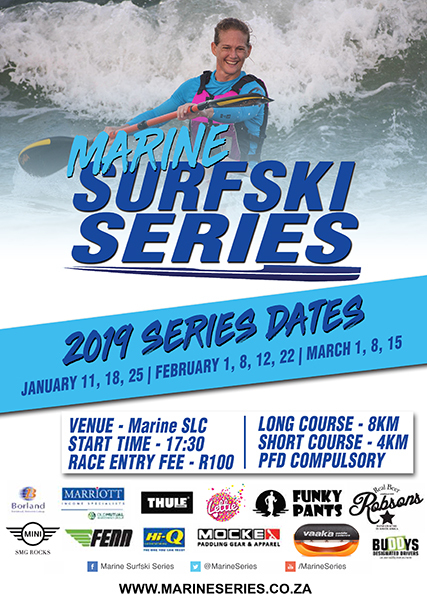 Race Ten, the Varsity College Surfski Challenge and Varsity College SA Schools Champs, of the 2018 FNB Surfski Series takes place at Marine Surf Lifesaving Club on Friday, 16 March.